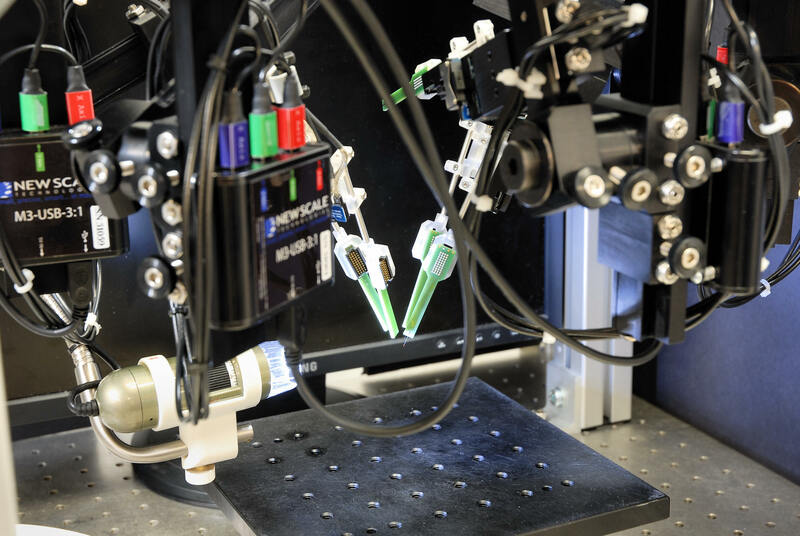 The MPM Multi-Probe Micromanipulator System provides convenient, automated positioning of multiple neural probes for acute in-vivo recording. Simple to set up and operate, it is the first micro-manipulator designed specifically for use with silicon probes. The compact design allows for independent positioning of multiple probes in the smallest space, with ample clear area for a virtual task environment. Automatically and independently move each probe to the optimum location in the brain. 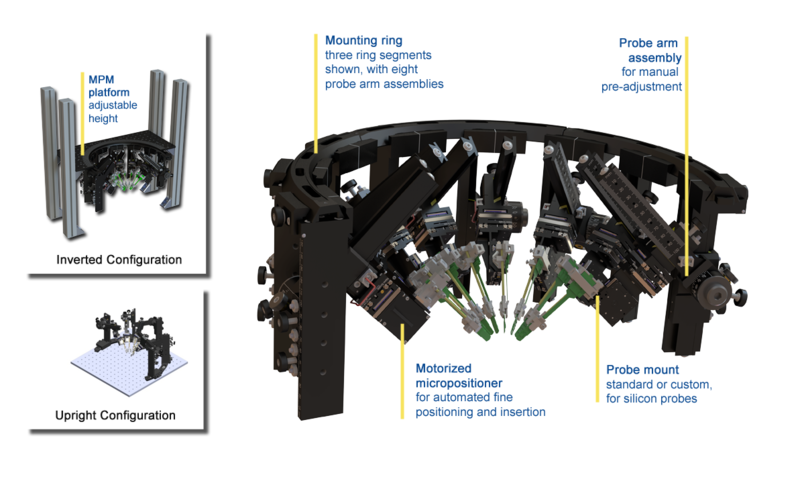 A mounting ring allows multiple probe arm assemblies to be positioned around the target – from one probe to eight or more. The ring mounts to standard laboratory tables with imperial or metric hole patterns. Alternatively, the arms can be inverted by mounting them to the underside of an elevated platform, maximizing clear space below the probes for animal interaction with a virtual task environment. Each probe arm has four degrees of freedom for initial pre-adjustment. Use the displacement markings to register the location of each probe in stereotaxic coordinates and calculate the approach angle. Coming soon: Enter this information into the Virtual Coordinate System with the MPM software, removing real-time geometry puzzles from the time it takes to do a recording. 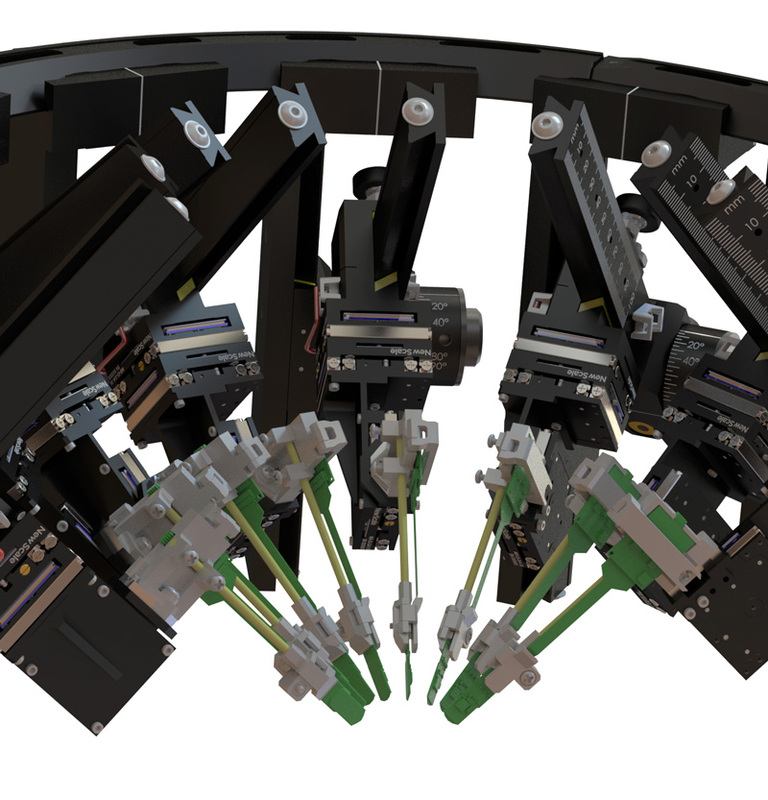 Each probe arm also has three axes of motorized motion for automated positioning. The motorized positioners allow precise control of x-y location and z insertion depth, automatically and independently moving each probe to the optimum location in the brain. The standard motorized positioners offer 15 mm of travel on each axis, with high force and stiffness. Learn more about the M3-LS micro stages. The New Scale MPM System automatically and independently positions multiple silicon probes for stable acute in-vivo research including electrophysiology and optogenetics. 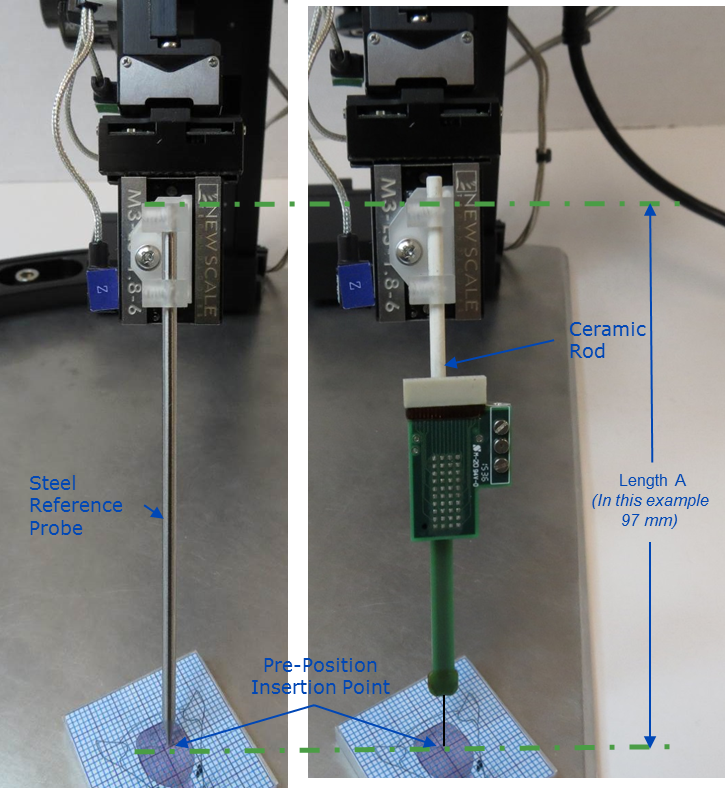 The MPM System is the first micromanipulator specifically designed for silicon probes. It is also compatible with tetrodes and other probes. It can be used to simultaneously position optical waveguides or optical fibers for research combining electrophysiology with optogenetic stimulation. Probe mounting kits are available for many commercially available probes including Neropixels 1.0 probes with silcon or metal cap. We also offer custom probe mount design. A steel reference probe reduces setup time and minimizes risk of damage to probes during setup. Repeatable stops allow you to simply swing the probe arm up to replace the reference probe with a silicon probe, and return it to the target position. A tech note describes the probe mounting and pre-positioning solution for the NeuroNexus A32 probe with NeuroNexus OM32 adapter. Other adapters use a similar pre-positioning technique. Get the tech note. 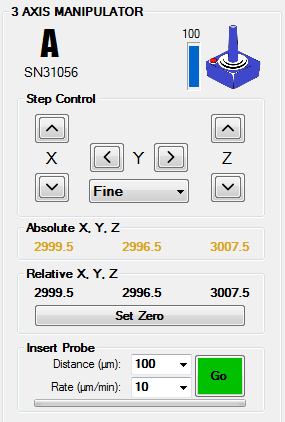 The MPM Software’s Virtual Coordinate System (beta) simplifies probe positioning. Enter the probe angle and displacement to register probe locations in stereotactic coordinates. The software automatically calculates the approach angle of each. All probes move independently within this global space, rather than along their local axes. This makes it much easier to position and keep track of multiple probe locations. Control up to eight probes in a single PC window. Open additional windows to control additional probes. Multiple editable configurations – step size, speed, axis associations, etc. MPM Systems are fully configurable for number of probe arms, inverted or upright position, and type of probe holders. Each system is complete and easy to assemble with the tools and hardware provided. All cables and connectors are labeled including standard USB cables to the PC. The MPM software installs on your Windows PC in minutes. Download manuals and software for your Multi-Probe Micromanipulator (MPM) System (registration required). Neuropixels 1.0 probes are supported by the MPM System. A probe holder for the ultra-high density Neuropixels probe from imec is available for order now. 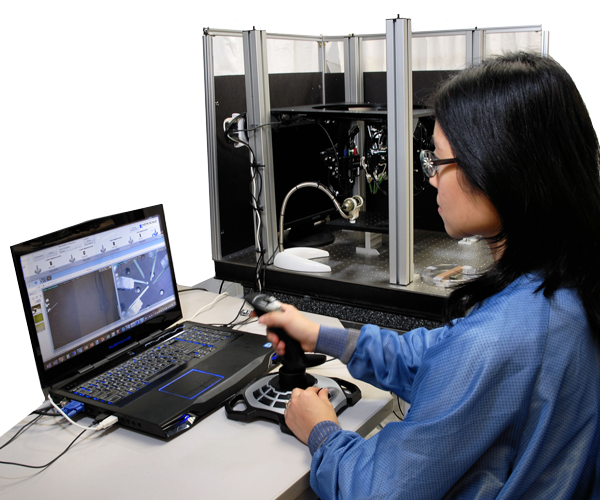 Sales and support for the Multi-Probe Micromanipulator (MPM) System is provided by our worldwide partners with experience in neuroscience and advanced research instrumentation.